In this post, I am going to offer you materials to teach the BREAK and GIVE collocations. This post is different in one aspect, though. This time, I will give you a series of pictures which you can download and combine into your own worksheets. The advantages of this approach are obvious. You can decide what you are going to teach and what materials you will use. You can throw away the things that do not work for you and add those you like. To insert the pictures into your worksheet, right click the picture and download it. Then insert it into your document and make it bigger or smaller as you need. The first part is the same. 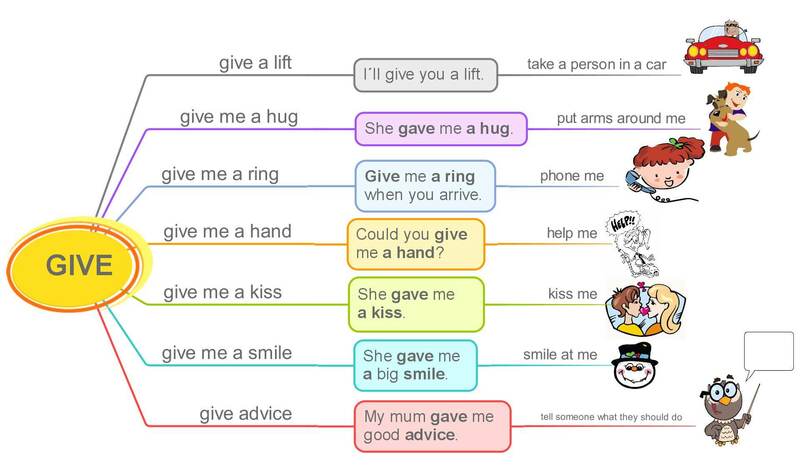 There are two infographics which show the collocations with the verbs BREAK and GIVE. I have created two speaking exercises. The first one is a simple pair dictation. Students work in pairs and dictate the sentences they have to their partner. Their partner listens and writes the missing sentences into their worksheet. The other speaking activity is done in pairs too. 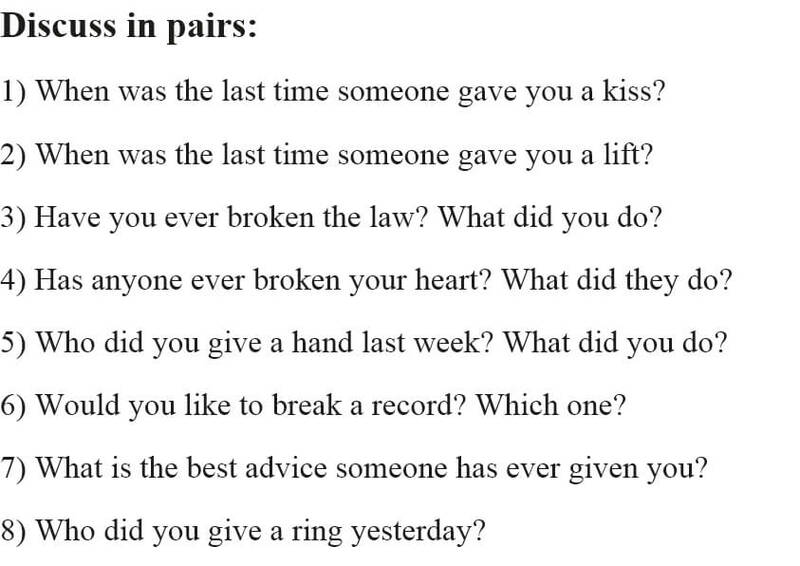 Students read the questions for their partners and they answer the questions. Now, there are four exercises which you can use for your students to practise the collocations with BREAK and GIVE. In the first exercise students should complete the phrasing by adding either BREAK or GIVE. The key: give a kiss, break the law, give him a hug, give me a lift, break the record, break her heart, give me advice, give him a hand, give me a smile. In the second exercise students should complete the sentences with the phrases from the exercise 1. In the third exercise students should match the collocations and the definitions. In the fourth exercise students should complete the second sentence with a phrase that has the same meaning as the expression in the first one. You can easily download all the files here: BREAK and GIVE Collocations zip.file. I hope you will find this new format really useful. In this way, you can easily create your own worksheets to teach the collocations with BREAK and GIVE.